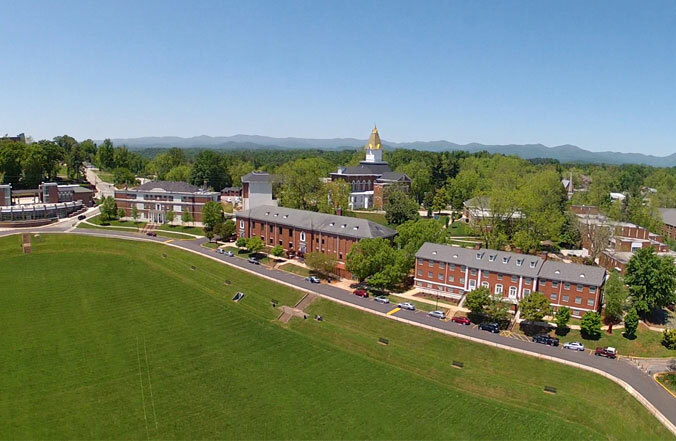 Traditions play an important role at the Dahlonega campus. As you move about campus, this information should help you in understanding those traditions. Freshmen, little arch please. 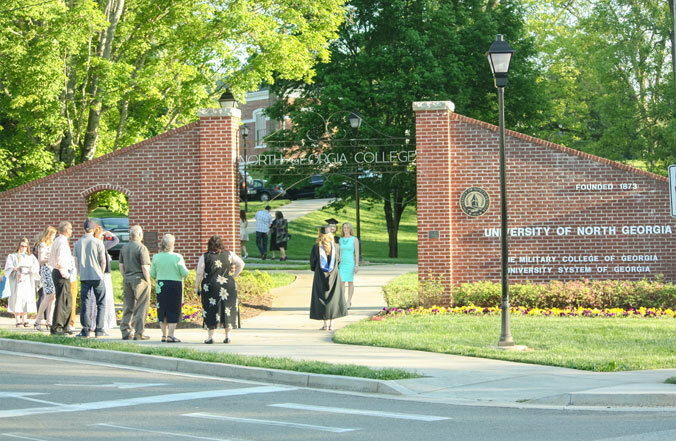 Tradition holds that freshman may not walk through the old Archway located on West Main Street; instead, there is a smaller arch through which they are supposed to walk. The arch is the original main entrance onto the university campus. Today, the main entrance is located off Chestatee Street on the other side of campus. No cutting across! The William J. Livsey Drill Field, named in honor of the North Georgia graduate who attained four-star general rank, is considered hallowed ground. The entire campus community is welcome to use it for appropriate purposes when it is not otherwise in use, and outdoor events often are held there. However, one of the university's long-standing traditions precludes using the Drill Field as a shortcut; this is not considered respectful of the field. Why has everyone stopped? 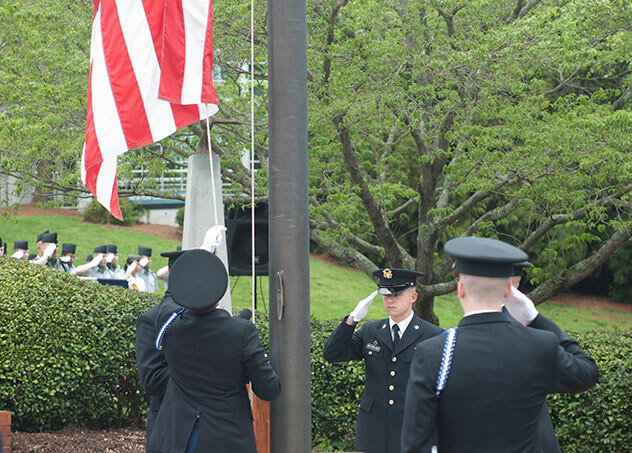 The American flag near Memorial Hall is raised (reveille) at 0700 (7 a.m.) and lowered (retreat) at 1700 (5 p.m.) Both of these ceremonies are normally preceded by a bugle call and firing of the cannon and accompanied by music. Those outdoors on campus at either of these times are expected to face the flag and remain still during the ceremony. Many also render an appropriate salute to the flag (right hand over the heart, hat in hand if wearing one, for civilians). Those driving an automobile on campus are expected to stop during the ceremony. Many also exit their vehicles, and render an appropriate salute, but that is personal choice. There's a group of marching cadets ahead...what do I do? 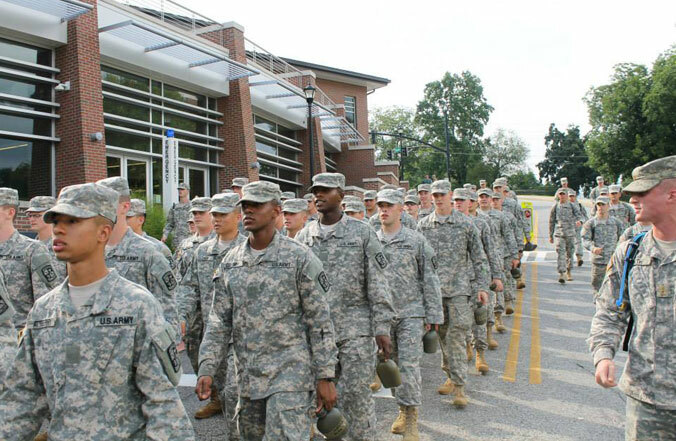 While it is never OK to run over pedestrians, military formations have the formal right-of-way on the roads of UNG's campus. Treat them as you would a slow vehicle. Formation leaders will often try to maneuver their cadets so that vehicles may safely pass, but this is not always easy or safe to do. Be patient.